You'll be £3.99 closer to your next £10.00 credit when you purchase Great Naval Battles of the Ancient Greek World. What's this? Naval warfare is the unsung hero of ancient Greek military history, often overshadowed by the more glorified land battles. Owen Rees looks to redress the balance, giving naval battles their due attention. This book presents a selection of thirteen naval battles that span a defining century in ancient Greek history, from the Ionian Revolt and Persian Invasion to the rise of external naval powers in the Mediterranean Sea, such as the Carthaginians. Each battle is set in context. The background, wider military campaigns, and the opposing forces are discussed, followed by a narrative and analysis of the fighting. Finally, the aftermath of the battles are dealt with, looking at the strategic implications of the outcome for both the victor and the defeated. The battle narratives are supported by maps and tactical diagrams, showing the deployment of the fleets and the wider geographical factors involved in battle. Written in an accessible tone, this book successfully shows that Greek naval warfare did not start and end at the battle of Salamis. The author displays his passion for his subject and his easy to read text covers each battle in context, to provide the reader with an understanding of how and when the battle was to be fought, in addition to the conduct of the conflict. There are good clear maps to illustrate the important points. Having never ventured into naval gaming I knew very little, and opened the book hoping to be lured in. In a word, I was. The author sets out to describe Greek Naval Battles in a very readable way. He starts with a general chapter on Greek naval warfare, which is a well-argued model of clarity. He then devotes a chapter to each of the battles: their context, their course and the consequences; each with its own map. Well written, without jargon, and is thus an extremely good introduction for the novice. As such, I recommend it unreservedly. To put is bluntly, this book is solid, well-organized, and very thorough... 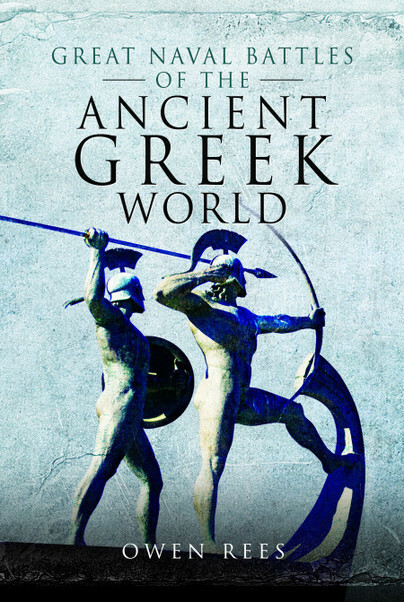 Highly recommended if you’d like to brush up on the naval battles of ancient Greece or even learn about them for the first time. Oh, and did I mention that each discussion contains maps! And even some diagrams to illustrate tactics and the formations for the battles where we have such information. ‘Great Naval Battles of the Ancient Greek World’ is a quick and informative read. It is the type of book that makes one think of how one would have coped in similar situations. It is not an overly scholarly tome although it does rely upon the ancient sources. This book is recommended as a good way to take one’s mind off the day-to-day minutia of modern life, and to think about how naval battles were fought two and a half thousand years ago. Go for it! Each battle starts by setting the background, explains the forces arranged on either side, then gets into the fighting. The aftermath is then discussed because these battles all need to be set in context. The author does a good job of all this, though, it might be worth reading his other Greek book first. This book covers thirteen battles and spends a good chunk of time putting them in their historical and political context. Even if you are coming to the period completely cold, you will rarely feel lost. The writing is straightforward and smooth, and there is a good number of simple, but clear, maps and diagrams to help understand each battle. The descriptions of the battles themselves really succeed in getting the reader into the picture. There were some rules of war but these were different from what we would expect today. Desperate hand to hand fighting, the slaughter of prisoners, some as sacrifices, and the execution of failed commanders all point to a bloodier age. Numerous battle plans add to the readers understanding as do the extensive endnotes and bibliography. I really enjoyed this book and would recommend it to anyone interested in early naval warfare or classical Greece. Owen Rees is a freelance historian, writer and researcher, as well as an assistant editor to Sparta: Journal of Ancient Spartan and Greek History. He studied Ancient History at the University of Reading and History (Research) at the University of Nottingham. He is a regular contributor to Ancient Warfare magazine.